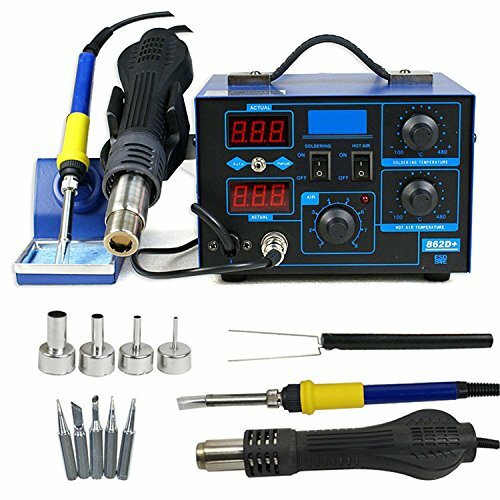 Brand new F2C 2in1 SMD Rework Soldering Station 862D+ which is improved from 852 and 862 series and inherited all advantages. Alloy metal body with high-quality silicone shell features elegant appearance and power saving. Especially suitable for mounting and reworking SMD components by hand. Repairing:The item will have one full year warranty from us starting from the day you got our parcel.In most cases when item got problems we shall send you necessary parts with free cost for your own replacement so you needn't return the machine to us for repairing. And we shall provide online technical guide for you to replace the parts. Return: (1)We offer refund if the item is not to your liking. 25% restocking fee will be applied on all kinds of refund.And the returning cost would at the buyer's responsibility. (2) If the product is damaged or non-working when you receive it , return shipping cost for such return should be at seller's responsibility. Suitable for heating shrink, paint drying, adhesive removal, thawing,warming,plastic welding. ;Fits for soldering and desoldering SOIC, CHIP, QFP, PLCC, BGA,SMD,etc. (especially mobile phone cable).